GOSH Velvet Touch lipsticks have a special place in my heart. The ubiquitous concealer-lips shade Darling was an absolute staple in the blogging world back in 2009, I even remember its number (134! 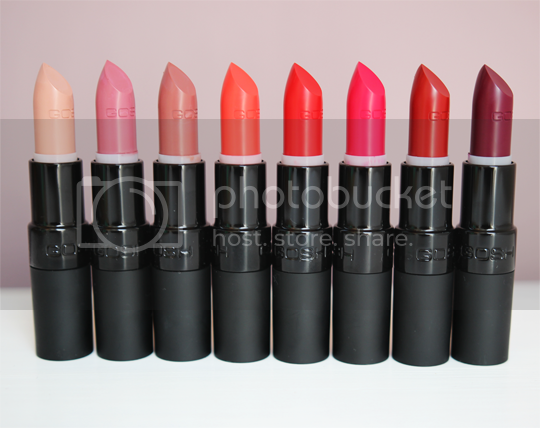 ), and it was one of the first lipsticks I bought when I started blogging. Let’s be honest, it wasn’t a great lipstick. Not only was the colour hugely unflattering on just about everyone – not that that stopped us wearing it – the formula wasn’t great either. I haven’t tried any other Velvet Touch lipsticks since then, until this brand new launch of 8 new matt shades to the range. Side note; am I the only one who really hates typing matt without an E on the end? Anyway, feast your eyes on the new GOSH Velvet Touch Matt Lipstick*. It’s been a long time since I tried a GOSH lipstick so I don’t know if the regular, non-matte ones still have the too-slippy, oily texture they used to have, but these are sort of the opposite. They feel just slightly on the dry side, despite the inclusion of ‘hyaluronic microspheres’, but are surprisingly comfortable on and don’t dehydrate the lips even when worn all day. The dry feeling is only apparent during application, where it takes a couple of swipes of the bullet to warm up and deposit colour smoothly and evenly. The first swipe drags a little, which makes it a challenge to apply the brighter or darker shades without a lip brush. They’re definitely worth the effort of a careful application, though, because the colours are beautiful and so long lasting. I wore Cherry through a barbecue and it barely even required a touch up! I actually like all 8 colours a lot. I thought I’d hate Baby Lips for being too pale and Plum for being too dark, but they are both much less harsh on the lips than they are in the bullet. If I could only pick one, Coral has to be my favourite – doesn’t it just scream summer?! GOSH Velvet Touch Matt Lipsticks cost a bargainous £6.99 each and are rolling out in Superdrug stores nationwide throughout August. Go get one!